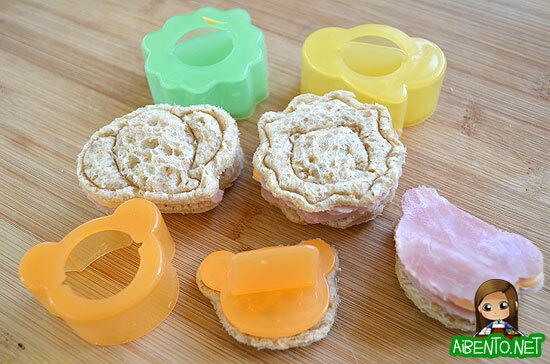 No doubt you cute bento moms out there just starting out have seen some form of these. They’re everywhere. 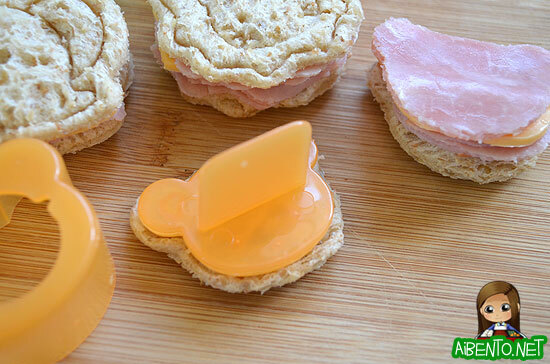 Cute sandwich cutters that come with presses to not just cut sandwiches into the shape of animals, but to put a face on it too! Bunnies, lions, bears, elephants, frogs, it’s all too cute to be believed! I’ve used them in bentos before, but I don’t know if I’ve ever really talked about using them. FYI, the bread that my household eats almost exclusively is Roman Meal Honey Oat. It doesn’t come out as great as with white bread, but we love wheat bread, so that’s what I’ve used here. 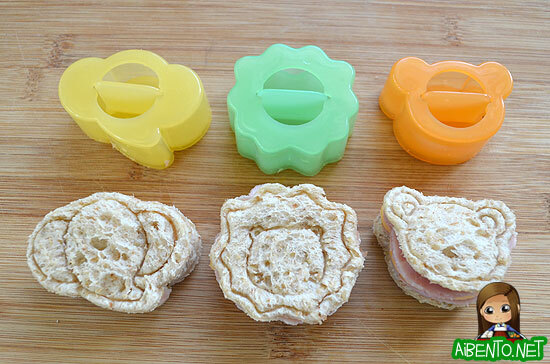 When I first got these, my first thought was that I make the sandwich and then use the cutters to cut out the sandwiches, then press down with the little press and voila! Cute sandwich. I learned very quickly that this is definitely not how you go about using them. Not unless you want a terribly mangled sandwich, a sore palm, and a lot more wasted meat and bread. What you want to do is cut each of the pieces of the top and bottom bread out, then fold up your meat and cut it out with the cutter too. If you’re not using something soft like bologna, you may need to rub the cutter back and forth slightly to get it to go through the meat. Cut your cheese next. You don’t really need to pay attention to whether an ear or bottom is missing on the cheese unless you plan to stick the cheese on top. This helps maximize meat, cheese, and bread usage. Next, assemble the bottom half of your sandwiches (adding mayo if desired) then press the design into the top bread. Don’t press it on while it’s on top of the rest of the sandwich or it will flatten your bottom bread and squish your cheese out the sides. The bread you press will flatten when you press the design in. Add it to the top of the sandwich and you’re done! As for the scraps, I chopped up the leftover bread, ham, and cheese and tossed it into a pan with some melted butter. Then I cracked an egg onto it, stirred it up until cooked, and had me a really yummy breakfast!